Road running fans are in for an epic showdown in April, as the best marathoners in the world will be at the starting line. Eliud Kipchoge (🐐) and Mary Keitany headline amazingly stacked fields both in the men’s and women’s race. Many are calling the announced women’s field the best ever collection of marathoners to line up in one race. In addition to Keitany, defending London champion Vivian Cheruiyot will participate will battle it out against reigning Berlin and Chicago winners Gladys Cherono and Brigid Kosgei. One of the greatest distance runners of all time, Tirunesh Dibaba, will also be there. As if that wasn’t enough, the chasing pack is filled with notable names such as Americans Molly Huddle, Emily Sisson and Allie Kieffer, and Australians Sinead Diver and Lisa Weightman. In the men’s race, we can find heavy hitters such as Shura Kitata, Wilson Kipsang and Mosinet Geremew. As previously announced, Mo Farah is of course back for another try at beating Kipchoge. And half marathon world record holder Abraham Kiptum will be looking for a definitive breakthrough in the marathon. In the chasing pack, Canadian marathon record holder Cam Levins will face names such as Australians Brett Robinson and Jack Rayner. Several of the confirmed runners for the London Marathon lined up to race the half marathon this morning in Houston. Shura Kitata took top honours in the men’s race with a winning time of 60:11. Among the women, Brigid Kosgei won with a new personal best of 65:50. Emily Sisson, debuting in the full marathon in London, threatened Molly Huddle’s half marathon record. Ultimately she came up short by five seconds, finishing 6th in 67:30. Australia’s Pat Tiernan, tipped by the Inside Running hosts to have a great year, ran a convincing 61:22. Ultrarunner Jim Walmsley took to the roads aiming to qualify for the US Olympic marathon trials. He cut it close, but with a 64:00 finish he literally hit the required standard. The full marathon didn’t feature runners of similar notoriety as the half, but it was still an exciting race. 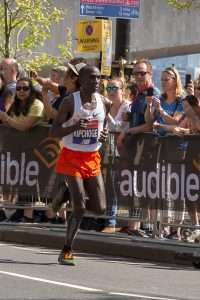 Albert Korir of Kenya took the win with a sprint finish but just missed out on the course record as he finished in 2:10:02. The women’s race was won in 2:23:38 by Biruktayit Degefa of Ethiopia. See the full results from all Houston Marathon 2019 races. This week’s most fascinating piece of running news came from Runner’s World and featured bananas. Or, more precisely, banana peels. If you were unaware, it turns out that the peels of all the bananas that runners typically consume during races pose a host of problems. Disney has now partnered with Chiquita, whose brand is found on bananas worldwide, to solve those problems. Strategically place waste receptors will help them collect the peels, and put them to good use. What might that be? As it turns out, 28 000 pounds of banana peels make for great fertiliser, or can even be turned into electricity.